In babies and children, exposure to lead in drinking water above the action level can result in delays in physical and mental development, along with slight deficits in attention span and learning abilities. In adults, it can cause increases in blood pressure. Adults who drink this water over many years could develop kidney problems or high blood pressure. Young children, infants and fetuses appear to be particularly vulnerable to lead poisoning. A dose of lead that would have little effect on an adult can have a big effect on a small body. Also, growing children will more rapidly adsorb any lead they consume. A child’s mental and physical development can be irreversibly stunted by over-exposure to lead. In infants, whose diet consists of liquids made with water—such as baby formula—lead in drinking water makes up an even greater proportion of total lead exposure (40 to 60 percent). Lead is rarely found in source water, but enters tap water through corrosion of plumbing materials. Very old and poorly maintained homes may be more likely to have lead pipes, joints, and solder. However, new homes are also at risk: even legally “lead-free” pipes may contain up to 8 percent lead. These pipes can leave significant amounts of lead in drinking water for the first several months after their installation. Federal standards initially limited the amount of lead in drinking water to 50 parts per billion (ppb). In light of new health and exposure data, EPA has set an action level of 15 ppb. 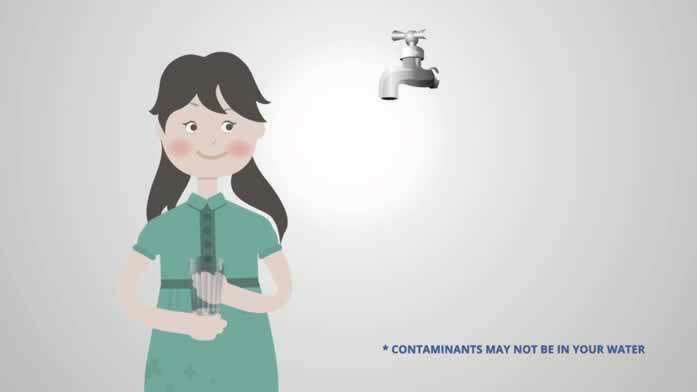 If tests show that the level of lead in your household water is in the area of 15 ppb or higher, it is advisable—especially if there are young children in the home—to reduce the lead level in your tap water as much as possible. (EPA estimates that more than 40 million U.S. residents use water that can contain lead in excess of 15 ppb.) Note: One ppb is equal to 1.0 microgram per liter (µg/1) or 0.001 milligram per liter (mg/1). You should have your water tested for lead. Since you cannot see, taste, or smell lead dissolved in water, testing is the only sure way of telling whether or not there are harmful quantities of lead in your drinking water. You should be particularly suspicious if your home has lead pipes (lead is a dull gray metal that is soft enough to be easily scratched with a house key), if you see signs of corrosion (frequent leaks, rust-colored water, stained dishes or laundry, or if your non-plastic plumbing is less than five years old. A number of cartridge type filtering devices are available. These devices use various types of filtering media, including carbon, ion exchange resins, activated alumina and other privately marketed products. If you own a well or another water source, you can treat the water to make it less corrosive. Corrosion control devices for individual households include calcite filters and other devices. Calcite filters should be installed in the line between the water source and any lead service connections or lead-soldered pipe.